Building on the lesson from last month, let's take a more advanced look at stop-shot safeties - this time allowing the cue ball to scoot to a new position after object-ball contact. 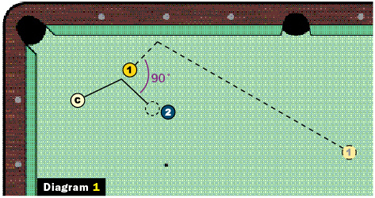 The central principle for the shots outlined below is the "90-degree rule," which states that when a sliding cue ball (i.e., a stop shot or stun shot, with no forward roll or backspin) strikes an object ball at an angle, the angle between their paths after the collision will be 90 degrees. To say it another way, we know that the cue ball in a stop shot will move perpendicular to the object ball after collision. This is a very handy rule for safeties, obviously, because it helps us place the cue ball in tough positions for our opponents with a good amount of accuracy. In our two previous lessons, we hit the object ball dead-on, resulting in a complete stop. In Diagrams 1 and 2, we're hitting the 1 ball at a slight angle, allowing it to come off at a 90-degree angle and drift into the 2 ball. 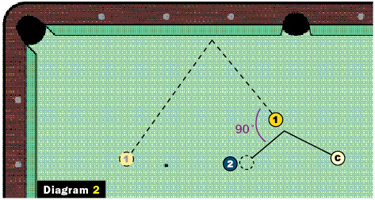 If I were approaching these shots at the table, I'd use the 90-degree rule to determine the contact point that would allow the cue ball to float over to the 2 ball, chart the 1 ball's path, and adjust the speed a bit to guarantee that the 1 ball ends up in a completely inaccessible position. The really crafty thing about these safeties is that the cue ball drifts close enough to the 2 ball to make a one-rail kick nearly impossible for my opponent. To even think about making contact with the 1 ball, he'll probably have to try going two rails, or something equally difficult.